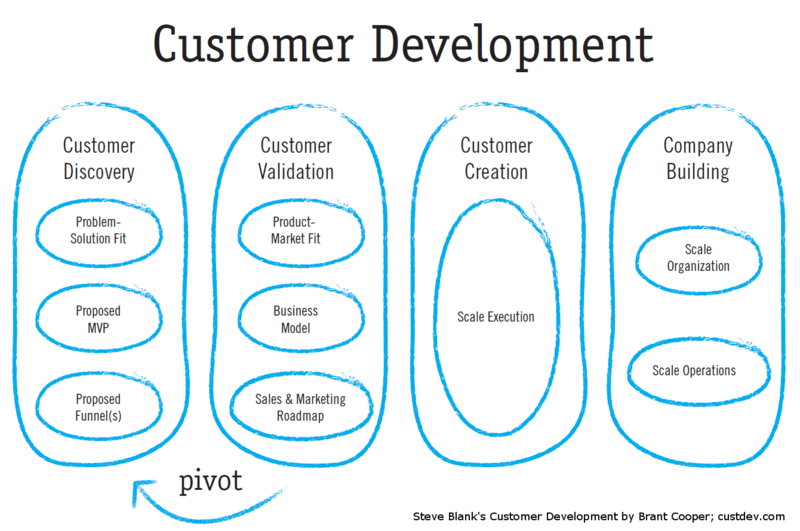 Customer Development is a four-step framework developed by serial entrepreneur and business school Professor Steve Blank for discovering and validating the right market for your idea, building the right product features that solve customers’ needs, testing the correct model and tactics for acquiring and converting customers, and deploying the right organization and resources to scale the business. At a high level, Customer Development is about questioning your core business assumptions. In other words, Customer Development teaches that rather than assume your beliefs about your business to be true, you should apply an engineering, or scientific method, to what is really not a scientific endeavor (building a business), in order to validate the ideas. The primary advantages of implementing the framework are that you don't spend gobs of money discovering what works, but rather save the money for executing and scaling what you have already shown to work. An organization applies a learning process, rather than merely executing what you assume to be the right business model. If implemented properly, Customer Development helps a business become highly focused, capital and resource efficient, and while not a guaranteed success, more likely to find Product-Market Fit and market traction. Where you are as a business determines where you are input into the Customer Development process. The earlier you start the better, since you are less likely to waste time and money. Where do you fit? Companies that are pre-Product-Market fit should start with Customer Discovery. Problem-Solution fit: You validate with prospects that a specific solution will solve a known problem to such a degree that they will buy it. MVP: You build a product that achieves (1) above and have validated it with prospects. Sales Funnel: Through interviews, surveys and analytics you have crystallized a proposed "sales and marketing roadmap," which lays out the customer's buying process and the business activities you must undertake to move prospects through the process (funnel). Companies that are at Product-Market fit should start with Customer Validation. You are at Product-Market fit, if you have built a product that customers need and this has been validated by high user adoption or through a significant number of paid users, and to some degree adoption and retention are "running themselves." P-M fit is an esoteric concept you only know you've achieved after you've achieved it. It's like declaring the "turning-point" in a game: only once you've won or lost, can you reasonably hypothesize the actual turning point. Customer Validation is about validating your proposed MVP and sales and marketing roadmap. You're not ready to scale -- hire outside sales, conduct a PR blitz, etc. -- until after Customer Validation. Validated MVP: You understand the core value you are providing your customers and they are passionate about your product. Validated Sales and Marketing roadmap: You understand your market segment and have optimized its conversion funnel from initial knowledge of your product through reference-able (or referring) customer. You have proven that every dollar you put into marketing and selling your product results in more than one dollar back. Validated Business Model: You have proven that your market can scale to sustain the business and that the lifetime value of your customer exceeds to costs of operating the business. CEO blames VP of Sales, who blames VP or Marketing, who blames budget. Eventually, they are all replaced by the Board and the cycle continues. The reasoning being, "Who can afford to stop and validate at this point?" Myriad unforeseen problems arise during this stage of the company. Unseen, since they were not accounted for and tested. if you are a completely new product type, you have to spends lots of money teaching your customers what you are and why you exist. if your key benefit is higher performing or less expensive (regardless of how new your technology is), you have to spend lots of marketing money to compete with existing players. Don't fool yourself: your competition will do anything it can to squash you; all is fair in love and product wars. Not only will your competition spread FUD, your ideal customer will resist you (status quo coefficient). if you can take your higher performance or lower cost and target a specific market niche, then your marketing costs are lower, but your segmentation and funnel discipline must be extremely high and your revenue plan must reflect the niche you're in. 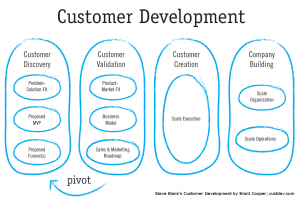 Upcoming: My take on the remaining Customer Development phases. If you would like to learn more, you should check out my book The Entrepreneur's Guide to Customer Development,) look at my services and downloads, or feel free to contact me. We are a Ruby on Rails consulting company and often find people coming to us with an idea they firmly believe in. I wonder how to ask them to go through this process before they kick start their development with us or atleast have a plan on doing it. Any suggestions would help.